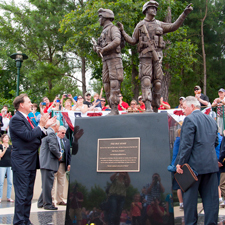 THE WOODLANDS, TEXAS (May 27, 2015) – The new Veterans Memorial Monument was dedicated at 4 p.m. on Memorial Day, May 25, 2015, in a moving ceremony on the east side of Town Green Park. In honor of active-duty personnel and veterans of all military branches and conflicts, the monument features a sculpture of two figures cast in bronze, representing U.S. Army Pfc. Cory Kosters of The Woodlands and U.S. Army Cpl. Zachary Endsley of Spring. Both men were killed in action in 2007, Kosters in Iraq and Endsley in Afghanistan. The monument site includes a retaining wall holding bronze military service branch emblems and a small vignette of a mother’s hand receiving a flag in memory of her lost soldier. Black granite memorial tiles, sold to help fund the memorial, form the paving around the base of the sculpture. Educational information including maps, and historical data of major wars since World War II are embedded in the paving surrounding the monument. Other speakers included former Township Chairman Nelda Blair, Township Chairman Bruce Tough, Montgomery County Precinct 3 Commissioner James Noack, Sculptor Edd Hayes, and Greater Woodlands Public Art Foundation Directors Everett Ison and Bill Wingo. Presentation of Colors was provided by The Woodlands College Park High School Junior ROTC, with invocation by Victoria Glover and the national anthem sung by Lisa Riola. With a previous recommendation from The Woodlands Township Economic Development Committee, The Woodlands Township Board of Directors waived the requirement for a $50,000 perpetual maintenance fund for the sculpture and allocated $81,900 for completion of the project. The monument is now a permanent way for the Woodlands Township residents and visitors to remember and honor active-duty personnel, veterans and all those who have paid the ultimate price for our freedom. Please visit www.thewoodlandstownship-tx.gov or call 281-210-3800 for more information. Photo: The monument was unveiled to a round of applause from local leaders and attendees.